All the major stats and numbers recorded during a consolation win for Pakistan in the T20I series. 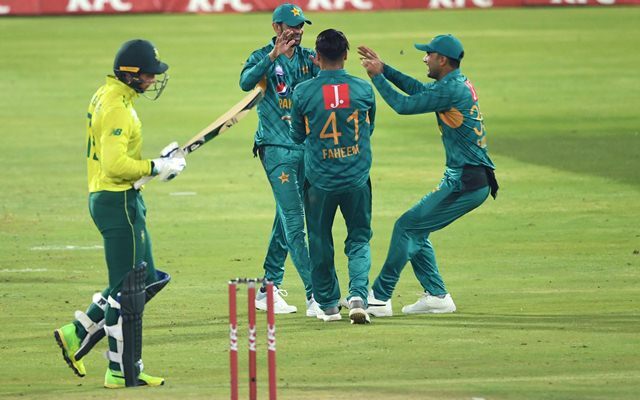 Pakistan’s T20I series winning streak came to an end following two narrow defeats in the first two T20Is in the 3-match series against South Africa. However, the visiting team ended the T20I series and their long tour of South Africa with a convincing 27-run win. Pakistan posted 168/9 in their 20 overs with contributions from all the batsmen. In the chase, South Africa’s top-order faltered and were reduced to 80/6 in 13 overs. Chris Morris’ unbeaten 55 and Rassie van der Dussen’s 41 helped the Proteas to finish with at least 141/9. 21 – Babar Azam hit 21 fours in this series; the joint 3rd most in a bilateral T20I series. Hamilton Masakadza hit 25 fours during the 2016 4-match T20I series against Bangladesh while Babar also hit 22 fours in the last year’s 3-match T20I series in Pakistan against the Windies. 56 – Pakistan hit as many as 56 fours during this T20I series; the 3rd most by any team in a bilateral T20I series. Pakistan hit a record 62 fours during the last year’s 3-match series against Windies while Bangladesh hit 58 fours during the 2016 4-match T20I series against Zimbabwe. 96 – The 96 fours hit by both the teams in this series are the 2nd most in a 3-match T20I series. The 2015 T20I series between South Africa and Windies witnessed 97 fours. Among 4-match T20I series, only Bangladesh-Zimbabwe series in 2016 recorded more as 112 fours were hit by both sides. 55* – Chris Morris became the first South African to score a fifty in T20I cricket while batting at No.7 or lower position. The previous highest score was 43 by Albie Morkel while batting at No.7 in the 2007 WT20 game against England. In fact, Morris’ unbeaten 55 is the joint 9th highest score in T20I cricket by a No.7 or lower position batsman. This is also the highest for South Africa in this format No.6 or lower position. David Miller scored an unbeaten 53 in the 2016 Durban T20I against Australia while batting at No.6. 1 – Pakistan’s total of 168/9 is the first T20I total of 150+ where the highest individual score was as low as 26 in the innings. Mohammad Rizwan’s score of 26 was the highest score for Pakistan in this game. 42 – The 42-run partnership between Mohammad Rizwan and Shoaib Malik for the 3rd wicket is the highest stand in this game that aggregated 309 runs. Only once before a T20I game had a 300+ aggregate with the highest partnership been 42 or lower. The 2008 Auckland T20I between New Zealand and England witnessed 336 runs being scored where the highest stand in the match was only 40. 168/9 – Pakistan’s total of 168/9 is the 3rd highest total in T20I format where no player reached 30. World XI made 177/7 against Pakistan in 2017 where their highest was 29* while Pakistan made 169/8 in the 2015 Dubai T20I against England. Earlier in the day, during the Women’s match between South Africa and Sri Lanka at the same venue, the hosts made 163/5 with a highest of 38 from Dane van Niekerk. This is the joint 2nd highest Women’s T20I total where no player got to 40. 4/14 – Beuran Hendricks’ bowling figures of 4/14 are the 2nd best in the losing cause for South Africa in T20I cricket. Dale Steyn had figures of 4/9 in his three overs during the 2007 Port Elizabeth T20I against Windies. Hendricks’ 4-fer is only the 2nd among the 16 4-wicket hauls by left-arm pacers in the T20I format that came in the losing cause. Mustafizur Rahman’s 5/27 against New Zealand in 2016 WT20 being the other such haul. 2 – Only the 2nd time South Africa had an individual fifty-plus score and a 4-wicket haul in the same T20I which they lost. The other such match was also against Pakistan during the 2010 WT20.